Multi-generational travel has become increasingly popular in recent years. That’s parents traveling with children, grandparents with grand-kids, even entire extended families traveling together. My family has taken a couple of multi-generational trips over the past several years to Europe; all were exceptionally rewarding. We’ve rented villas and apartments and gone skiing and touring. Not staying in hotels with hundreds of others certainly made for a more intimate vacation. Traveling as a family is always a great way to develop more profound experiences and great familial memories. But you don’t need to have an expensive vacation overseas to enjoy a great family get-together, whether multigenerational or not. There are plenty of places in the U.S. and Canada that are perfect for family getaways. You can spend a week skiing at one of the numerous resorts in the east or west. If you’re not a family that enjoys winter sports, head for the ocean to enjoy the beach or whale watching. And, of course, many major U.S. and Canadian cities are perfect for vacations any time of year. But what you don’t want to do is drag kids around to see things in which they have no interest. Also, as all parents know, there’s usually that incredible issue with age. There aren’t many teenagers who enjoy seeing the same things as a six-year-old. But there are places that are age-neutral: a U.S. or Canadian National Park. Just choose carefully. In the U.S. the Great Smoky Mountains National Park is a great place to visit (and I love it). Straddling the border of Tennessee and North Carolina, it’s the most popular national park in the country. But it may not be the best choice for a multi-day family vacation since it is relatively small. Furthermore, all area hotels are outside the park. 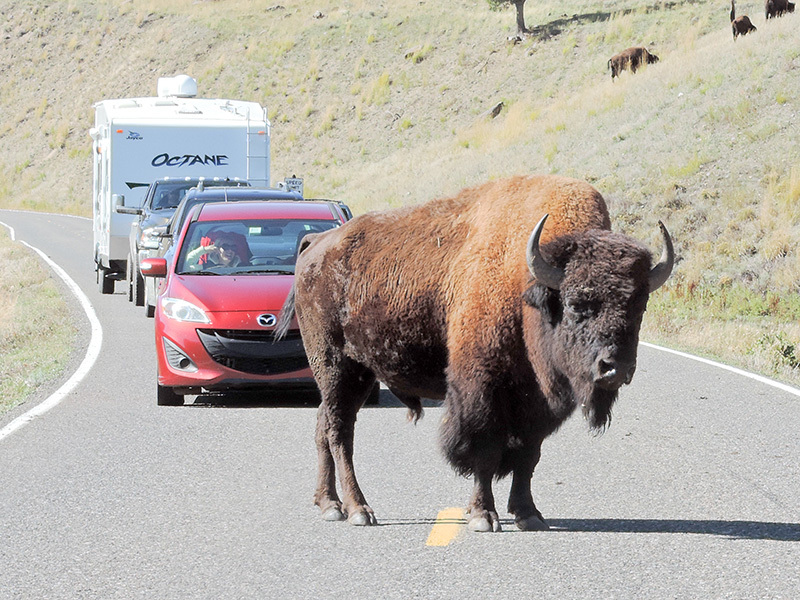 A better choice may be fabled Yellowstone National Park, one of the world’s greatest wildlife sanctuaries. Known worldwide as the “American Serengeti”, as an entity it’s older than most governments of the world. It’s also the world’s first national park and is a UNESCO World Heritage Site. In many respects, it’s a panacea that bridges all generational gaps. Both kids and adults love Yellowstone since 97% of it is still pristine wilderness. 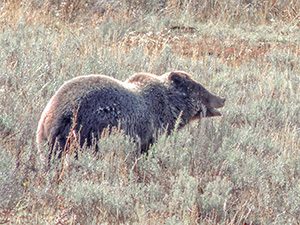 That means that there’s an incredible range of wildlife to view, including grizzly bears, bison, elk, wolves, moose and more, as well as 320 species of birds. Yellowstone is named after the river that runs through it. It is home to 67 species of mammals (including grizzly bears, elk, moose, bison, and wolves) and 320 bird species. 31 wolves were reintroduced into the park in the 1990s. There are now more than 300 of them in the area. On average Old Faithful erupts every 92 minutes, but that can vary from 51 to 120 minutes. Its eruptions are as high as 180 feet. 132 square-mile Yellowstone Lake is the largest high elevation lake in North America. It is so large it creates its own weather. The park sits on top of an active volcano and has one of the world’s largest calderas at 45 x 30 miles (72 x 48 km). It also has 1,000­ to 3,000 earthquakes annually. The park has more than 10,000 hydrothermal features and more than 500 active geysers (more than half of all in the world). 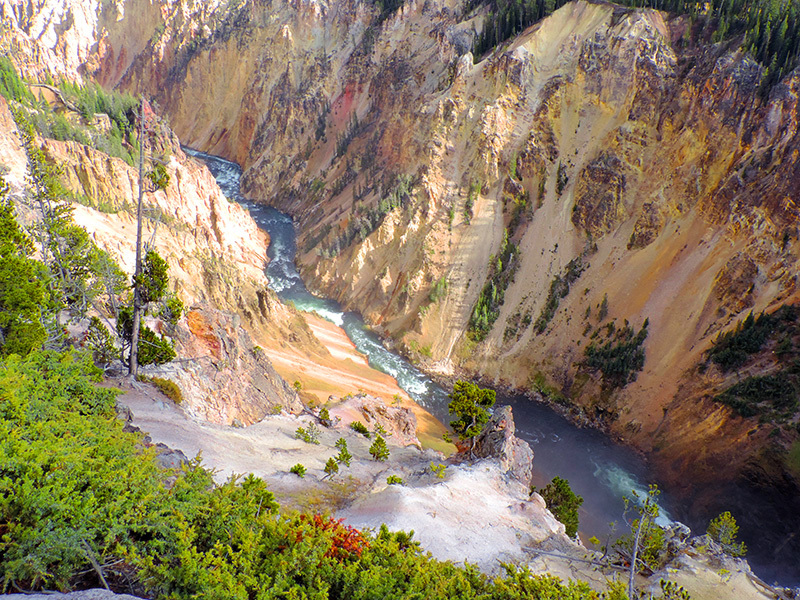 Yellowstone is 3,472 square miles (8,991 km2) — that’s larger than Rhode Island and Delaware combined. It is 96% in Wyoming, 3% in Montana, and 1% in Idaho. 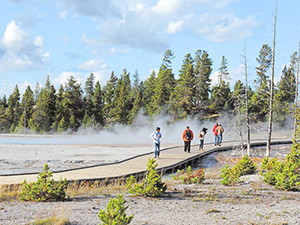 Yellowstone hosts around four million visits each year, more than half happening during June, July, and August. 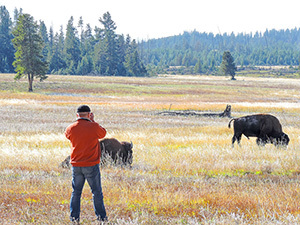 The park’s 2 million acres are primarily in Wyoming, with snippets in Montana and Idaho. The nearest airports are in Cody and Jackson, WY, although you can also fly into Montana. Yellowstone sits in a vast volcanic caldera, the reason it’s also rich in geysers and hot springs. 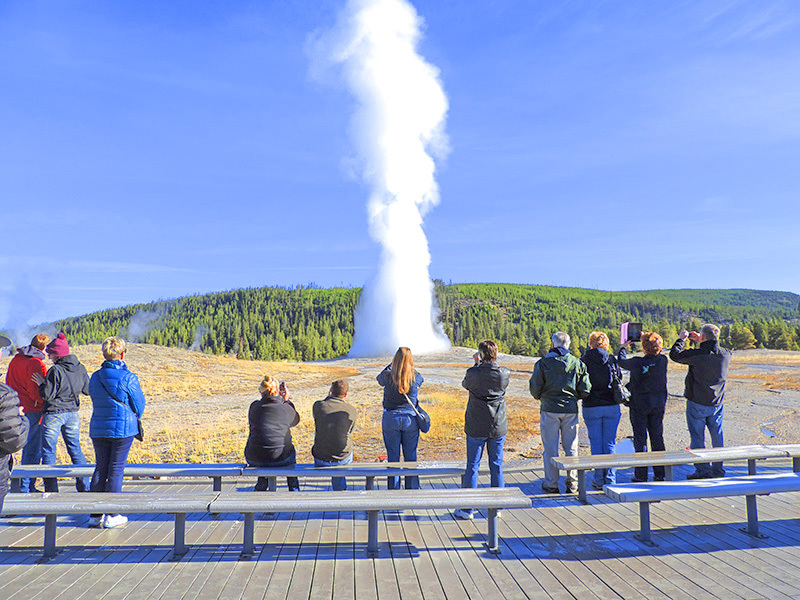 Although Old Faithful is its most famous geyser, there are many more in the park. 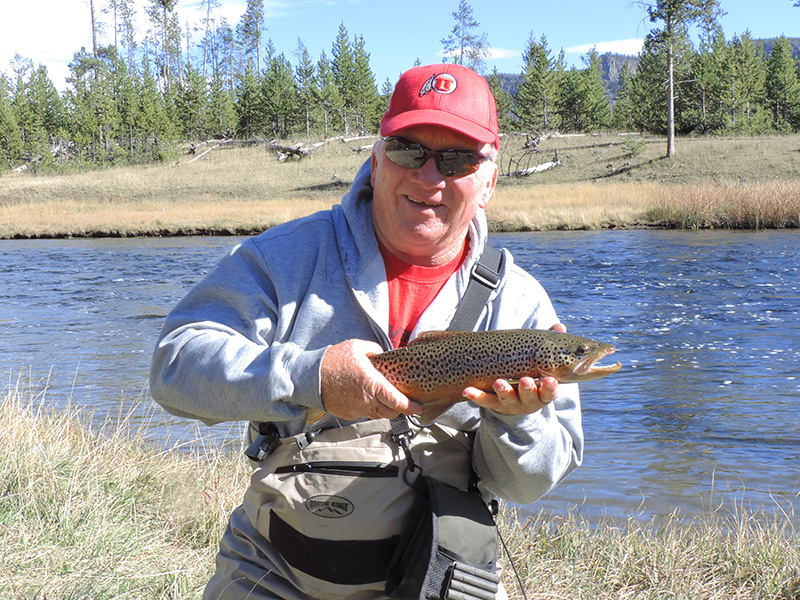 In addition to viewing some pretty spectacular wildlife, there are also a lot of other things to do on a Yellowstone family vacation including fishing, horseback riding, boating, and hiking, the later on more than 1,000 miles of back-country trail. But as with any vacation, the major problem is its planning. The one organizing the trip’s logistics often spends weeks or months, far in advance, researching. They find that available lodging is tight or non-existent in prime season. When found, hotels seem too far from the sites they want to visit. Costs can spiral out of control. The way to overcome the problem, of course, is to let someone else do the planning. For a worry-free Yellowstone family vacation, it can be the best course of action especially if you need accommodations during high season. For a family trip to Yellowstone, I’d recommend Austin Adventures in Billings, MT. It’s a family company specializing in family travel. They do all of the planning and take care of all the details based on your preferences. In fact, Austin’s tour to Yellowstone – now known as “Yellowstone Family Vacation & Tour” – was the first trip the company offered when it began business 23 years ago. By next year they plan to offer 50 family adventures around the world. Austin’s guides know the park intimately, which is always incredibly important on a tour. When the iconic Yellowstone sites such as Old Faithful and Mammoth Hot Springs get crowded, they know where to go. They also pride themselves on their know-how in stimulating both 6- and 16-year-olds, as well as the 60+ generation. They can be great enablers – and enable you to have quality family time rather than worrying about 1,000 details.